Yahoo launched its email service, called Yahoo Mail, back in 1997, which means that there are now countless people with over two decades of unorganized emails. If you’re one of them and would like to restore your Yahoo inbox to its former glory, this article is here to teach you how to clean up Yahoo mailbox using Clean Email, the only email cleanup tool you’ll ever need. Should I Still Use Yahoo! Mail? Considering how many email services have been released since Yahoo! Mail’s launch in 1997, it’s only natural to wonder if Yahoo Mail is still a good choice after all these years. It’s important to realize that the Yahoo Mail people use today is only vaguely similar to the original Yahoo Mail. After several design overhauls and countless feature updates, Yahoo Mail has matured into a competitive product that rivals Gmail, Outlook, and other big email services in many ways. For starters, the free version of Yahoo Mail includes 1 TB of storage space, which means that learning how to empty Yahoo inbox is almost never necessary. 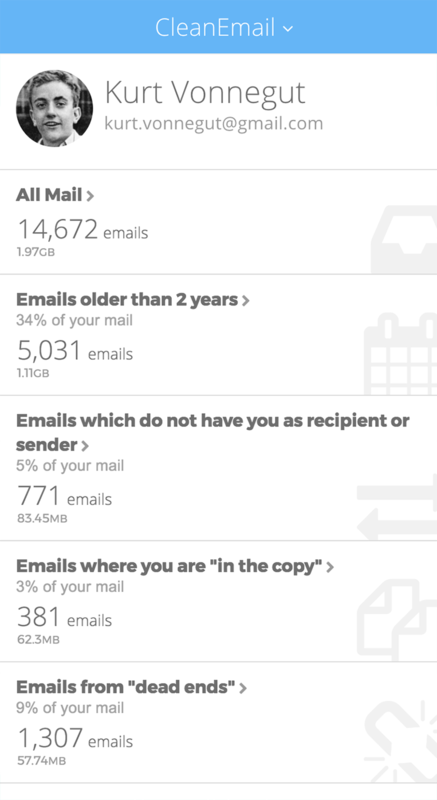 With Yahoo’s Attach Large Files app, it’s possible to send email attachments up to 100 MB, compared with the standard limit of 25 MB. Yahoo Mail supports the POP3, IMAP, and SMTP email protocols, features spam and virus protection, and supports customizable filters for the automatic organization of incoming messages. There’s also a paid version of Yahoo’s email service, called Yahoo Mail Pro. With it, you get unlimited email storage capacity, the ability to use a personalized domain name and email address, and several other perks. People sometimes buy Yahoo Mail Pro to avoid Yahoo inbox cleanup, but doing such a thing is hardly ever a good idea. There are much better ways how to clean up Yahoo mailbox, namely Clean Email, which we describe in detail later in this article. Unfortunately, Yahoo Mail doesn’t exactly have a clean security record. In fact, it’s been the target of a number of large-scale data breaches, including one that impacted 3 billion user accounts. Yahoo users were urged several times to change their passwords, but many have decided to delete their accounts instead—sometimes because they lost trust in the company and sometimes because they found their Yahoo inbox empty. At the end of the day, you have to decide whether you’re willing to give Yahoo yet another chance to prove that they can improve the security of their products enough to prevent hackers from breaching their defenses. How Can I Clean Up My Yahoo Email? Depending on the current state of your inbox, you may think learning how to clean up Yahoo Mail is a waste of time. In this section, we would like to show you that inbox clean up can be easy—you just need to know how to approach it. We understand that email management is probably not your favorite activity, but postponing it only makes it worse. 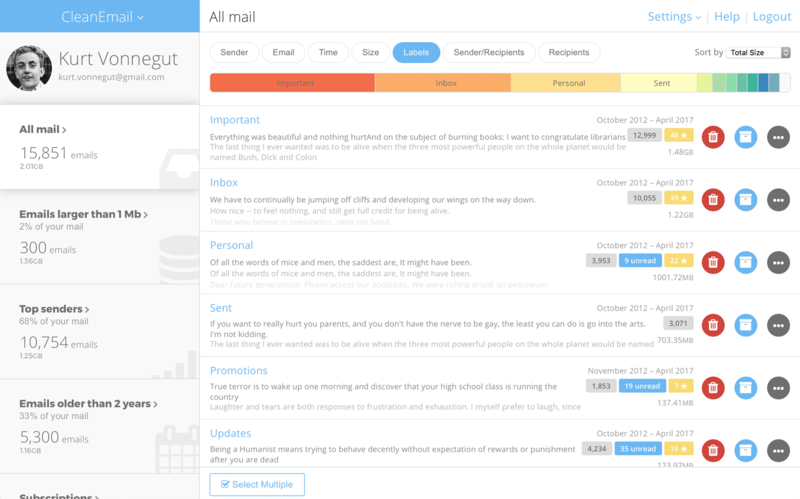 Ideally, you should clean up your inbox at least twice a day, once in the morning and once after work. Depending on how quickly your bosses, colleagues, friends, and family expect you to reply, you might also want to check your inbox during the day, but always do so mindfully. Resist the temptation to open your inbox while being immersed in work as it takes just one urgent email to interrupt your flow and make you forget what you were doing. Modern email service providers, such as Yahoo Mail, and email clients support a number of useful email management features that can help you keep your mailbox clean. For example, Yahoo Mail has intelligent filters, allowing Yahoo Mail delete all inbox spam and junk messages as soon as you receive them. With a capable email cleanup tool, it’s possible to clean up Yahoo inbox with a few simple clicks and in just a few minutes. There are many email cleanup tools available, but our favorite is Clean Email because it combines a beautiful user interface with an assortment of powerful features. It takes no time at all to learn how to clean out Yahoo inbox with Clean Email, as illustrated in the next section. How Can I Manage and Organize My Yahoo Inbox with Clean Email? Clean Email works with a number of email services, including Yahoo Email, and features an intuitive inbox cleanup process. When you connect Clean Email to Yahoo clean your inbox, the application will automatically sort your emails into bundles. One bundle will contain unread emails, another bundle will contain junk and spam emails, and so on. You can then decide what you would like Clean Email to do with each bundle—delete it, archive it, mark it as read, remove it, etc. This way, you can Yahoo mail clean your inbox in just a few minutes regardless of whether you have a few dozen emails or a few hundred thousand. Clean Email also comes with handy automation features, which allow you to apply any action to new emails coming to your mailbox without any manual work. For example, Clean Email can automatically mark all social media notifications as read for you, so they don’t bother you since you’ve most likely seen them on your phone anyway. Of course, creating automation rules is just as simple and intuitive as the rest of the application. If you’ve been using the same Yahoo inbox for years and would like to organize it and keep using it, we have good news for you: Clean Email can clean Yahoo mailbox in just a few minutes and ensure that it will remain clean even in the future with its smart automation features.